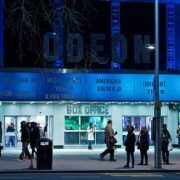 The future of the Kensington Odeon? 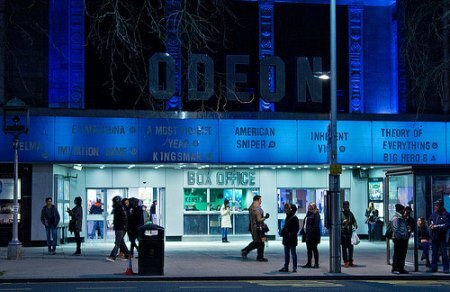 Just what is the future of Kensington Odeon? The saga rolls on although the cinema has been closed since last autumn. In order to preserve the original planning consent, demolition was started last year but it stopped as Minerva, its owners, sought to sell the site. As a result we have a derelict eyesore which, as we feared, is the worst of all possible outcomes. There is however both good and bad news. Guy Oliver, a local resident and Trustee of Save, set up a group named The Friends of Kensington Odeon, to seek designation of the Odeon as an Asset of Community Value (ACV). ESSA and some others supported that application which, if successful, would provide a visionary multi-function centre for performing arts, which would complement the visual arts centre at the Design Museum. A presentation was arranged for the 25th May, at which the Council voted unanimously in favour on condition that further financial details were provided by the 31st May, which they were. That was the good news! Two days later came a shock – the Planning Department gave notice that the application had been turned down! The Council has now admitted that an error had occurred and a formal complaint has been made to which a response is awaited. A question is being asked in the House of Lords and steps have been taken to protect the position of The Friends of Kensington Odeon. If you would like to know how you can support this proposal please contact ESSA at essaW8@gmail.com. Assuming that this ends with good news what is the current position? An ACV means that if the owner is trying to sell the site they have to give the community six months to come up with a proposal to purchase. During that period the proposals would have to be developed in more detail both to test their viability and to acquire financial support. This would be a tremendous step forward in the regeneration of this end of the High Street, something for which we were fighting at the appeal in January this year. It would however leave the Post Office counter property and sorting office open for development. Would the development of the Odeon encourage that to happen and would it influence the particular use which might be most appropriate? If you have any ideas on this please do let ESSA know at essaW8@gmail.com. Kensington High Street is one of places being considered for review under the Local Plan Partial Review so it might be an appropriate time to seize the opportunity to put forward proposals. In 1903 the roadway leading to the timber yard behind the western terrace of Edwardes Square was officially named St Mary Abbott’s Place; this was changed in 1925 to the current spelling of St Mary Abbot’s Place. 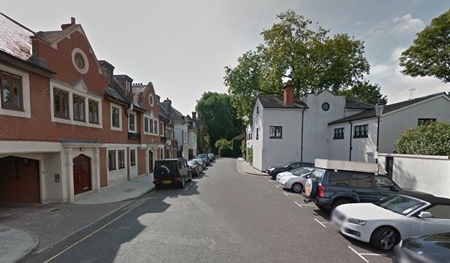 On the eastern side, backing on to the properties in Edwardes Square, several new artists’ studios and houses were erected to designs by Arthur Leighton, a junior partner in Gale, Gotch and Leighton. Number 9 was designed in the same general style as its neighbours but was slightly larger to provide a dwelling, studio and generous space at the back for a school of animal painting for the artist Frank Calderon. This was planned round a central courtyard with a separate entrance from the street. The building was constructed in 1911-1912 but, with the closure of the art school during the First World War, the house and studio were occupied separately and houses were built for other artists creating an artistic enclave of reasonably consistent style. From 1941 the whole building was occupied by White Eagle Lodge a spiritualist charity. More recently activity at White Eagle Lodge diminished and, a few years ago, the premises were sold for development. An application was made for demolition and the construction of five new flats which was refused in January this year. ‘The house at 9 St. Mary Abbot’s Place shows early 20th century Arts and Crafts influenced architecture that forms part of a consistent townscape. It has some historical value in its former use as an artist’s studio. In our view the building makes a positive contribution to the surrounding conservation area, and the proposals should be assessed in accordance with paragraph 134 of the NPPF’. In spite of this advice the planners’ report a few days later makes no reference to this guidance and the balance of harm including that of the Conservation against public benefit has not been tested as is required by the NPPF (National Planning Policy Framework). The RBKC has specific supplementary guidance regarding protection of the typology of artists’ studios and their form, which is incorporated in Policy CL1. The planners are proposing to release an addendum to their initial report but this will only be one day before the Planning Committee meeting. For obvious reasons this is not acceptable and we are protesting because there will be inadequate time to consider, and if necessary to object, to the recommendation. What does 2016 hold for developments and planning in Kensington? https://www.mountgrangeheritage.co.uk/wp-content/uploads/2016/06/16289453997_bf3647d0ed.jpg 292 450 kelly https://www.mountgrangeheritage.co.uk/wp-content/uploads/2018/05/mountgrange-heritage-logo.png kelly2016-07-04 13:19:402018-09-03 15:34:44The future of the Kensington Odeon? What does Brexit mean for London’s rental market?